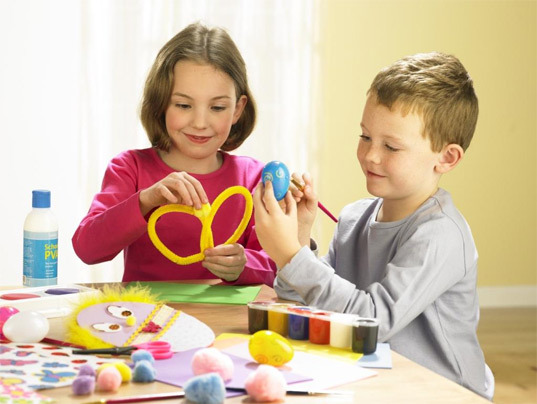 Crafting is one of the most interesting activities students enjoy in school. The school trains its students from a young age to be involved in craft making. By making crafts, students can build their imagination. Apart from having endless fun, they can express themselves creatively and achieve the sense of accomplishment. Crafts that involve drawing, coloring, painting, cutting, gluing, and even stamping excite students. At Dikshant, Art and Craft covers paper tearing and pasting, freehand drawing, shading, painting in oil and water colours, landscape painting, collage making, stenciling, printmaking, paper folding, decorative craft, three-dimensional design, flower making, pattern making. The joy in using one's own hands to create something beautiful out of waste material is incomparable. Students have learnt the technique of Papier-mâché. They create Papier-mâché themselves by recycling old waste paper. These Papier-mâché objects are then enhanced by various means like oil painting. The experience and joy of utilising waste material to create something useful helps students understand and appreciate the simplicity and beauty of nature. Arts and crafts can help a child to feel, to imagine, to share, to understand how things work. They learn to dream, to build, to create and learn to be caring and giving people. It aids with their sense of generosity when they can make things for others, like cards, gifts. It promotes compassion, makes them feel for others and gives them the satisfaction of knowing the joy that they have brought to another with their creativity.